Sunday afternoon and what better place to be than a wine tasting? This one had particularly caught our attention with the vintages on offer – all from the Loire Valley, all whites. With nary a red in sight, we figured this would be close to Frank’s idea of heaven – especially with the vintages on offer. We couldn’t quite place the address, but set off regardless never suspecting that tucked away in the basement of a classically subdued, black building in a somewhat nondescript Vancouver neighbourhood, Liberty Wine Merchants would have a traditional, cellar-style tasting room. It was just the first surprise of the afternoon. Following the tradition of an afternoon garden party, we were greeted by a glass of Moncontour n/v Touraine Tete de Cuvee Brut. A blend of 95% Chenin Blanc and 5% Chardonnay, this sparkler offered good acidity, a traditionally yeasty nose, and the crisp Chenin flavour. At $24.99, we agreed this is a pleasant wine and a good value. Next up was a Coing de Saint Fiarce 2005 Muscadet Sevre-et-Maine Sur Lie that immediately garnered the first star of our evolving Frank’s Rating System – that’s one star for good enough to stock, two stars for a wine that will definitely become a regular, and two stars with a “B” for rush out and buy this wine right now! Frank immediately said lime apple with a touch of iodine. I passed on the apple component. But we both agreed this is one to stock and a perfect match with seafood. At $23.99, it will also likely replace our current standard Muscadet for everyday sipping. We felt the Chesnanie 2005 Muscadet Sevre-et-Maine Sur Lie that came next was, while still pleasant and typical of a Muscadet, was overall less balanced than the previous wine – especially as the price point was identical. With the slight briny background taste, it would be worth trying with salty oysters – in other words, we’ll probably have to be heading down to Granville Island for a visit to The Lobster Man, our favourite oyster supplier. 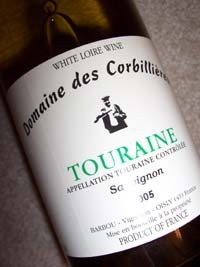 However, our eyes popped with the first swirl of the Domaine des Corbillieres 2005 Touraine Sauvignon that was next. Mint – no question about it. Subtle yet distinct, this wine actually has a note of mint. By far the most unusual wine of the afternoon, this one ranked the coveted two stars with a “B” designation. A steal at $19.99. We were disappointed by the Valery Renaudat 2003 Quincy that followed. Little nose and dull on the palate. At $34.99, we’ll stick with a Sancerre or Pouilly. Turns out there is also no information on the web – at least none we could find. A Tinel Blondelet 2005 Sancerre la Croix Canat was next, and our taste buds were soon revived. Bright, crisp, and flinty, this one is a good example of Sancerre. Absolutely cries out for goat cheese. Frank also detected a hint of gooseberry and fresh cut grass. $34.99. The following Tinel Blondelet 2005 Pouilly Fume had a disappointing lack of aromatics and was not at all what we’d consider typical of a Pouilly. At the same price point, the Sancerre was a far better value. When we got home, we discovered neither of us had any notes at all on the Baumard 2004 Vin de Pays Jardin de la France La Caleche that came next. Well, not quite, but suffice it to say we simply didn’t like this wine. $19.99. The Chamboureau 2002 Savennieres was a typical Chenin Blanc, although at $34.99 neither of us could decide whether we actually liked it. No web information was forthcoming on a search later. We didn’t linger much over the Hureau 2003 Saumur that was next up. Pleasant enough but at $37.99 not stellar value. We moved forward in the line up quickly. 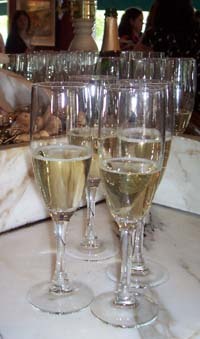 Next was the afternoon’s second two star wine – a Champalou 2003 Vouvray Cuvee de Fondraux. Great aromatics with plenty of tropical fruits, there was still enough acidity to balance the sugar nicely. Great value at $33.99. The Baumard 2003 Savennieres Trie Speciale that followed left a somewhat bitter after taste. We both gave this one a shrug and moved on – especially at a $49.99 price point. The final wine of our French Garden Party was a Champalou 2003 Vouvray Cuvee Moelleuse. Rich with the aromas and texture of noble rot, this was another two star favourite. Full bodied and rich, it was the perfect wine to end with – we were both still enjoying the long, lingering finish many minutes later. Same price as the previous wine but with a whole lot more personality and attitude. Two stars with a B to Buy! This entry was posted in Chenin Blanc, Loire Valley, Muscadet, Pouilly Fume, Sancerre, Vouvray and tagged Chenin Blanc, Loire Valley, Muscadet, Sancerre, Saumur, Sauvignon blanc, Wine, Wine tasting descriptors. Bookmark the permalink.